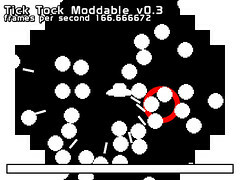 I recently answered some questions about Tick Tock Moddable for firstdropshow.com and it got posted today. You can find the article here. Go check it out. 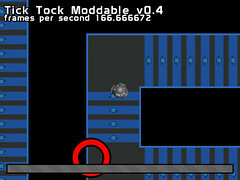 Here is a another small update to Tick Tock Moddable. I added a simple menu that you can use to choose what mod you want to load. I also added a Wii style pause menu. That pause menu doesn’t really scale properly yet for different resolution but its still usable even you aren’t running the game at 640×480. Now you can enter and exit any object in the game world. Really this should be limited to vehicles but for the time being you can also enter crates and even the blasts in the 1bit Invaders mod. I like the idea of being able to hide (even if its not really hiding yet since the zombies still always know you are there) in the crates in They Do Not Die so I’m actually considering leaving it enabled for them. The controls and more noticeably the collision detection isn’t correct yet with vehicles. 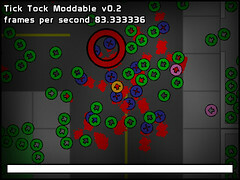 But I assure you that it will later work more like it does in Tick Tock Car Race. I added a port/mod of UFO Racers. Its even less playable then the other mods but its something that will be improved upon over time. I fixed the problem with non power of two resolutions with OpenGL but for reasons that I’m not going to bother getting into now I’ve disabled OpenGL support for now (turning it on in the settings.ini file won’t do anything). It will be brought back later. Now the game can optionally (its on by default) remember what the floor looks like regardless of how far you travel (with it turned off things like blood and corpses disappear when you get too far away from them). 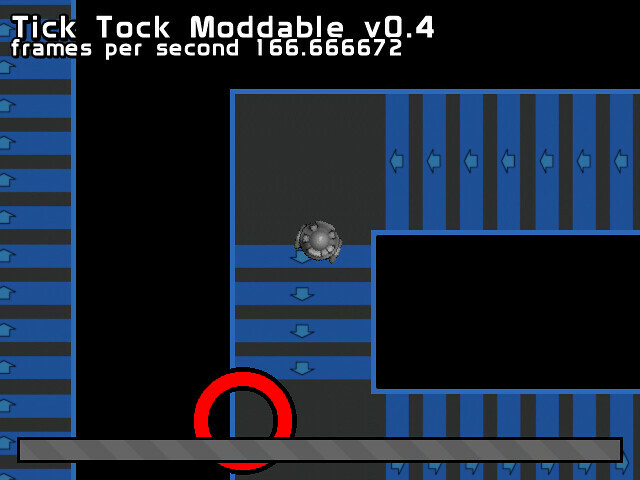 Displaying the frame rate is optional now (its also on by default). If you are only going to play one I still recommend you play the They Do Not Die mod. Here is a very small update. Mostly changes and fixes that aren’t really noticeable from playing the game. I’m not going to bother listing everything that has changed. 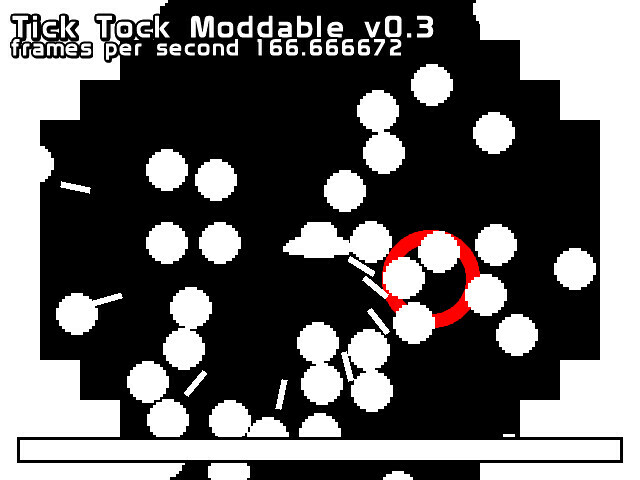 I’ve begun porting another old game of mine called 1bit Invaders to run in the engine. But its not done yet so I left the clone of They Do Not Die as the default mod. As before if you want to play one of the other mods just rename the folders and feel free to try editing things. I’ve also begun adding OpenGL support (you can turn it on by editing the settings.ini file) but right now it really just uses OpenGL as an unnecessary middleman. Everything is still rendered in software by blitting SDL surfaces and manually editing pixels and with OpenGL turned on it just converts that software rendered screen to a texture and maps it onto one quad that fills the screen. So there is no visual benefit or performance benefit yet and really the only reason to use it is if you want to record the game with fraps or some similar piece of software that is dependent on OpenGL. If you do turn on OpenGL mode you should first change the width and height of the screen to a power of two (like 512 by 512) or you can expect it to either run horribly slow or crash. I know I said that I wasn’t going to be doing any work on this for a short while but clearly I must be some kind of lying liar who lies because I have an update to share with you all. You still cant drive the vehicles but I’ve fixed up a lot of behind the scenes stuff and made it a bit more customizable. 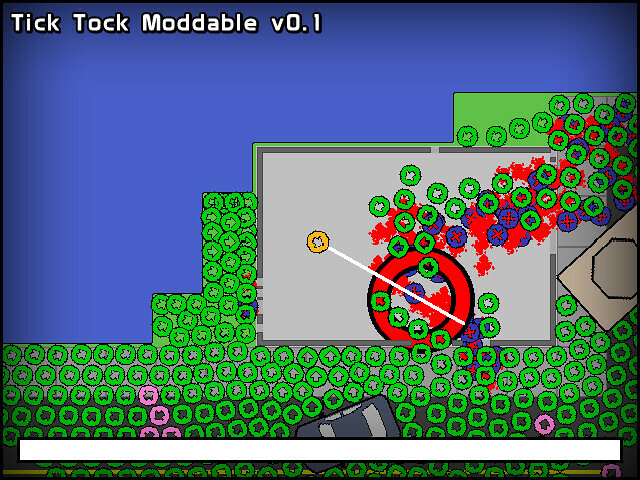 As a result of that additional level of customization I was able to port over TheyDoNotDie to run in the engine. Admittedly not much of an accomplishment considering that its essentially the exact same game but its a start. There is still no way to select what mod to play so if you want to play it like it was in the previous release (more tick tock zombie shooter style) then just go into the mods folder and rename the oldDefault folder to Default. You an also change more things from the settings.ini file. I fixed up some problems with running the game at higher resolutions so you should be able to set that to whatever you want now. Now you can also turn off or on camera zoom, screen overlays and other things which will enable you to get the game running faster. One thing worth noting though is that having trackmarks turned on (which enables drawing on the ground wish is currently just used for blood and corpses) actually makes the game run faster on average though turning it off will save a very small amount of ram. There is also an on screen frame rate counter now. I’m interested to hear how well its running for people. It performs acceptably for me as long as I keep it at 640×480 but since the game uses software rendering (I do intend to add hardware accelerated OpenGL rendering eventually but not until everything else is done) it will always be pretty taxing to play it at a higher resolution. 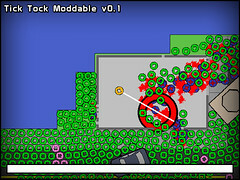 Here is the first build of Tick Tock Moddable. The plan is for it to be an open world game and to be sufficiently customizable for people to use it to build their own open world games. 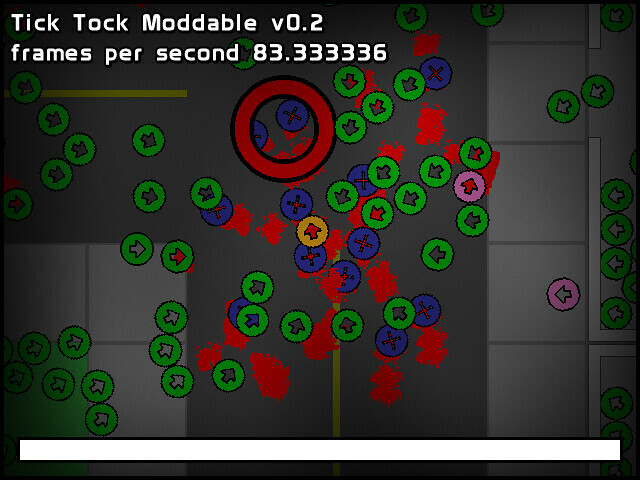 But right now its pretty much just Tick Tock Zombie Shooter with a few things missing and a few things added. Its not actually very customizable yet but I have externalized some variables so you can at least change a few things (like how many zombies will spawn or how quickly they move) by editing ini files. I’ll write up a manual for how to build a mod for the game once its actually possible. I was debating whether or not I should even post it at this stage in development (as a result of how lazy I’ve been feeling for the last few days its very incomplete) but I figured I might as well release what I have since I won’t be working on it for a short while (I want to turn my focus back to what I’m doing for the upcoming Nintendomax competition). There will be a Wii version (and possible versions for other platforms) but I’m not going to bother porting it until its more complete.